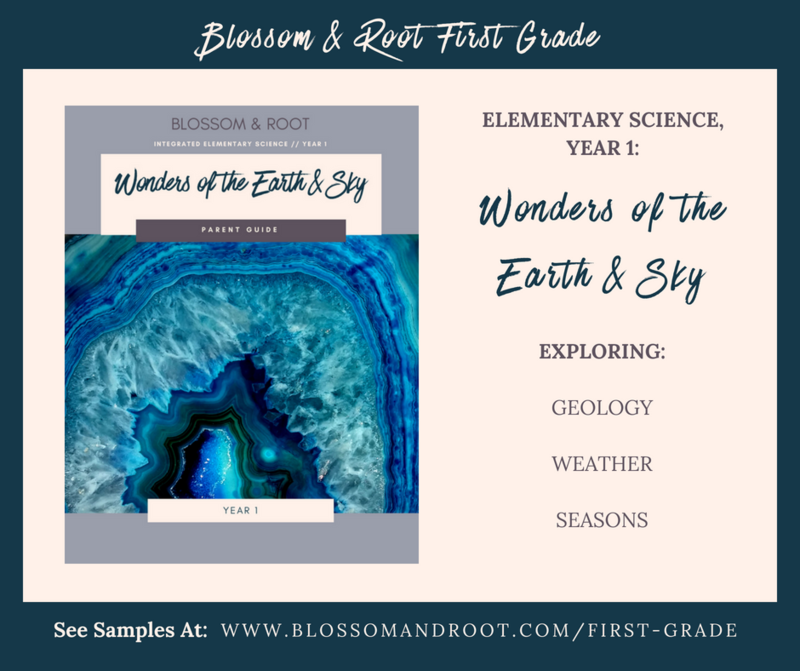 Blossom & Root First Grade: Wonder, Discovery, and Delightful Foundations! Click here to see First Grade in our store! Click here to download our first grade scope and sequence, as well as a book list for our first grade curriculum! Are you struggling to find a secular first grade curriculum for your child? Do you dream of providing a hands-on program for your young learner but aren’t sure where to start? 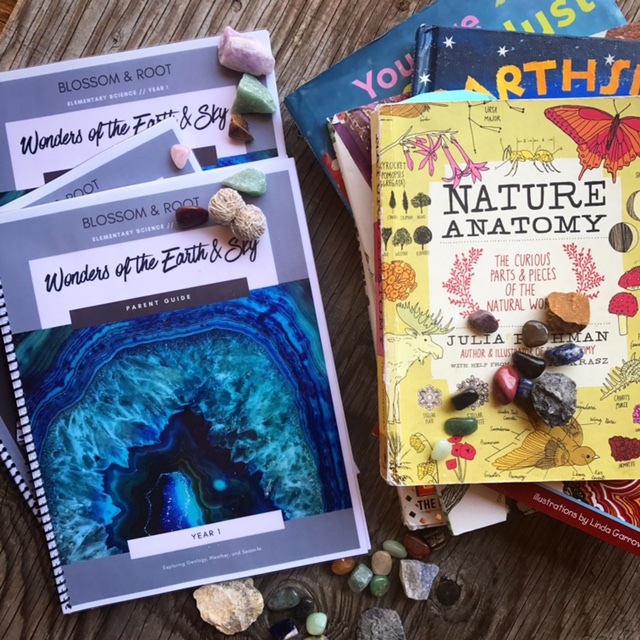 Do you wish you could find a comprehensive open-and-go first grade curriculum full of discovery-filled science and nature, the arts, and engaging children’s literature, in addition to a gentle introduction to key academic foundations? 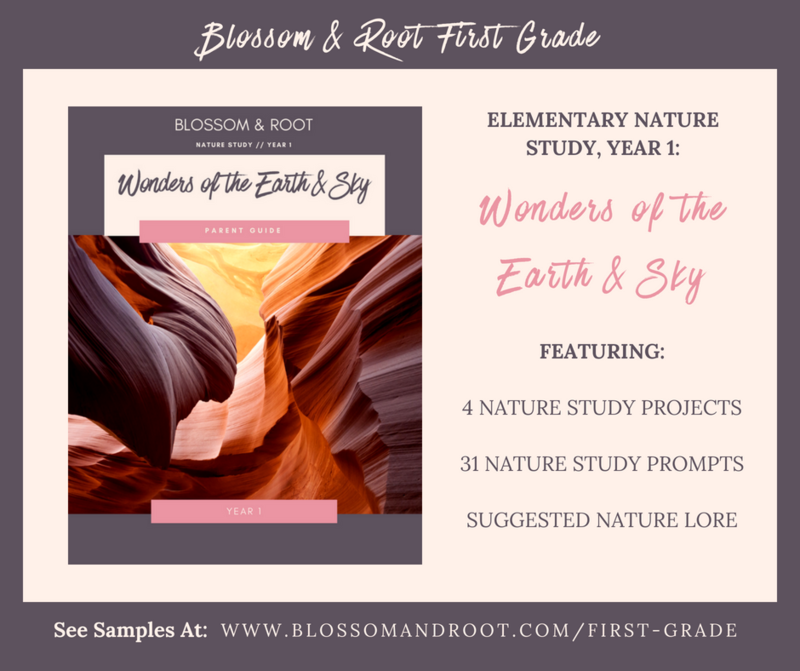 – A lively, adventure-filled science curriculum and coordinating nature study curriculum focusing on geology, weather, and seasons. Includes a student notebook for science and a nature notebook to document your adventures. – A living-books inspired language arts program full of fairytales, folktales, and nature stories. 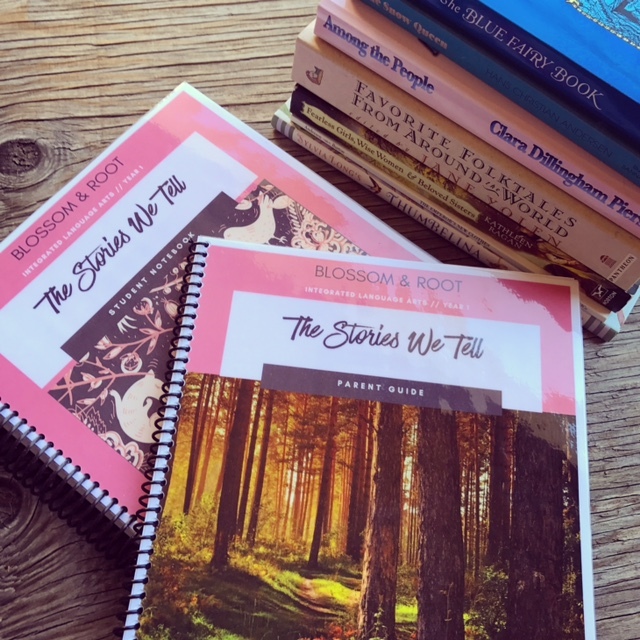 Includes engaging literature projects, journaling, word building, mini-poem activities, narration, and copywork. This curriculum also integrates geography and culture as you explore the countries of origin for over a dozen world folktales. Includes student notebook. We carefully designed our curriculum to work for the parent on a budget, and provide suggestions for acquiring all of the needed books, music, art, and supplies at minimal cost. You won’t find a $800.00 minimal investment requirement here! Most of our activities use what you already have around your home, and are designed to be flexible for all budgets and families. We also designed our curriculum with the busy parent in mind. 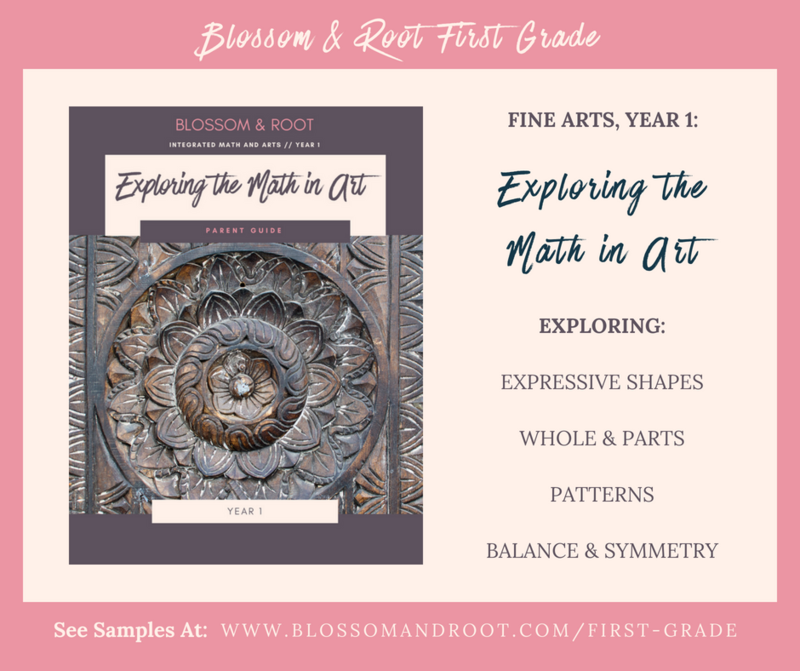 Whether you’re a working parent, or a homeschooling mom of five kids in different learning stages, you can give your first grader an exceptional year with Blossom & Root First Grade. Most days require approximately 2 hours of focused time together. Best of all, our science, nature study, art projects, and many of the read-alouds in our language arts program, can all be done as a family, even with a ride range of ages. 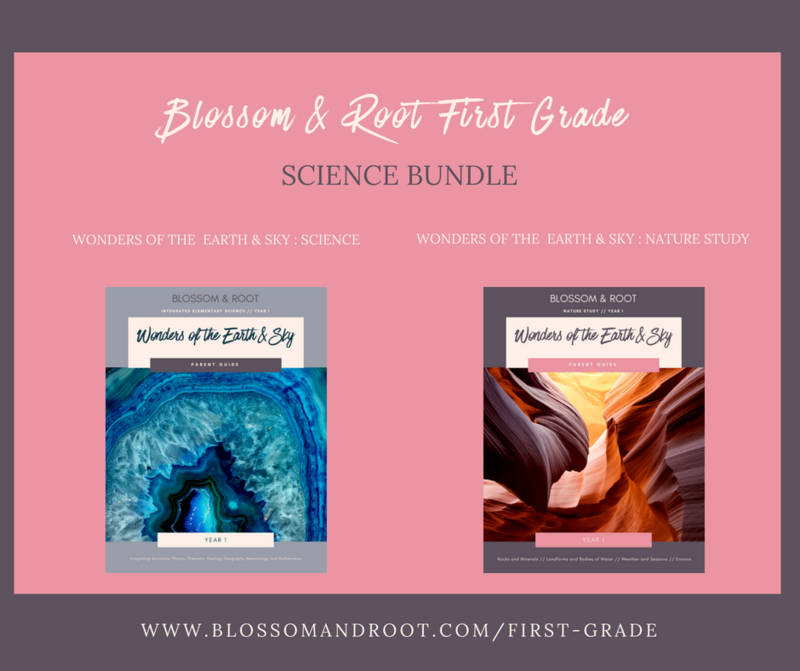 With Blossom & Root First Grade, you can truly give your child a year of wonder and discovery! They will make friends with some of the most influential and important artists in human history, listen to you read from the best children’s literature ever written, explore their own artistic voice, discover the beauty of the world right outside their door, and play with science concepts, all while developing a solid foundation in reading, writing, and investigative thinking that will provide them with confidence in the years to come. 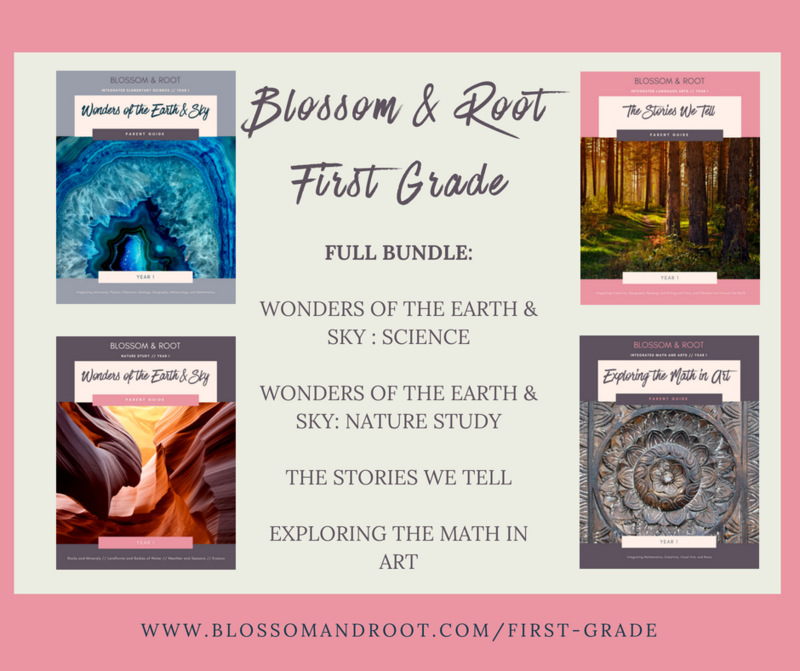 Who is Blossom & Root First Grade for? Most of our lessons can be divided up into about two hours of focused time together, five days a week. Our lessons are short, most of them around twenty to thirty minutes long. We want your child to have LOTS of time for free play and outside time, and believe they can have a rich learning experience without spending their entire day buried in worksheets. A typical week in our curriculum will require around half an hour (or less) to prepare for. We suggest looking at the book and supply lists in the parent guide as soon as possible, and collecting your materials before the school year begins. Books can be ordered online, found in used book stores, or borrowed from the library. Be sure to print and bind the student notebooks before beginning. You can also simply put them into a three-ring binder. 3) Does my child need to know how to read at all before beginning? Your child should be familiar with blending simple CVC (consonant-vowel-consonant) words together, such as “cat” and “mat.” We do spend some time on reviewing these, but a familiarity with them with help when beginning this curriculum. Yes you can! Scroll up this page to find samples of every piece of our first grade curriculum! 5) Should I add a more structured math program to this curriculum if I wish? Yes, we highly recommend that you add a complete, sequential math program to our first grade curriculum. Wild Math is a wonderful, nature-based option that we feel integrates well with our curriculum. Right Start and Singapore are also wonderful options. 6) Can non-secular families use Blossom & Root curriculum? Unfortunately, we cannot provide ANY refunds, returns, or exchanges. Due to the nature of a digital download, these options are NOT available. Please be certain of your decision before you purchase this curriculum. If you would like, you can visit https://blossomandroot.com for a FREE sample download to try before you buy. If you have any technical difficulties downloading your curriculum, please contact us immediately and we will help you. 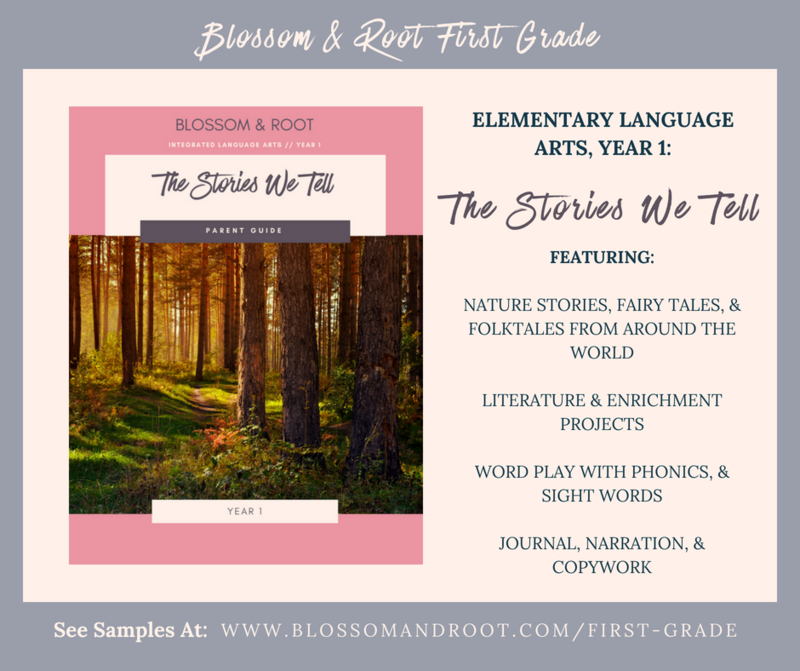 Kristina Garner, the voice of Blossom & Root, wrote the Early Years, Kindergarten, and First Grade curricula for parents looking for a home education for their child with an emphasis on nature, the arts, quality literature, and a hands-on approach to learning. She has a B.A. in theatre from the University of Colorado at Denver, is ECE teacher and director certified, and spent over 15 years working with children ages 2 1/2 to 13 in a variety of educational and outreach settings. She now homeschools her two young daughters and dedicates her time and energy to developing high-quality educational materials for homeschooling parents. Her passion for the arts and nature in education drives her to create the best possible curriculum and materials for early home education at an affordable price for homeschooling families.